China Qin Dynasty - HISTORY'S HISTORIESYou are history. We are the future. At the end of the Zhou period, several Chinese states were still at war. This was the ​Warring States Period, a 250 year stretch of time in which Chinese kingdoms were almost always battling one another for power. It was a time of disorder and political instability. As you know, the Chinese believed in the Mandate of Heaven. According to that belief, wars and other troubles were signs that the ruling dynasty had lost the favor of heaven. The next ruler of China, Ying Zheng, came from the Chinese state of Qin (pronounced "Chin"). When Zheng turned 13 years old, he became king of Qin. The first thing the young king did was order the construction of his tomb. He ordered 720,000 conscript laborers (non-paid) to hurry up and build his tomb to his specifications. The second thing he did was go to war with his neighbors, including the last Zhou king. It took him quite a while to get rid of everyone who was bothering him in ancient China. By the time he was 38, however, he had ended the internal battles between warring states, conquered rival states, and driven out nomadic invaders. In doing that, Zheng created China's first united empire. That had never happened before. The different feudal states in China had been at war with each other since Xia times. Big ruling families rose up, but they never controlled all of China. Ying Zheng was the first to do so. After his great achievement, the new ruler wanted a new name. He did not want to be called a king. That was too common. After his conquests, he declared himself First Emperor and adopted the name Qin Shi Huang di. "Qin" indicated his birth place, the state of Qin. "Shi Huang di" means "Yellow Emperor," or "First Awe-Inspiring Emperor." Built to protect China, his extension of the Great Wall was one of Qin's many achievements. By ending the period of Warring States and uniting the different states, Qin greatly expanded Chinese borders. By most accounts, Emperor Qin - sometimes referred to as the "Tiger of Qin" - was a strict and enormously powerful leader with a commanding presence. One advisor described the emperor as having "all-seeing eyes. His chest is like that of a bird of prey and his voice like that of a jackal. He is merciless, with the heart of a tiger or a wolf." First Emperor Qin set about running all of China just as he had so successfully run the state of Qin, and that meant change on a massive scale was in order, change that would affect nearly every aspect of Chinese society. In the 15 years that he was First Emperor Qin, he accomplished an amazing amount of change. He did not, however, accomplish things through acts of kindness. Qin believed in the Legalist way of running the country and much of his rule was cruel. It was illegal, for instance, to complain about Qin’s government. If you simply said that things could be better, you could be put to death. First Emperor Qin ran his dynasty with absolute control, and he maintained that control by enacting strict laws accompanied by extreme and harsh punishments. One of the first things Qin did to control his large empire was to change the way it was managed. Management: Qin divided his empire into 36 provinces. He divided each of the provinces into districts. He put two officials in charge of each province – a governor and a defender. Part of their job was to put strong people in charge in each district. Bureaucracy: Those changes, however, did not provide enough order for First Emperor Qin. He wanted trained people in charge at every level. To accomplish this, he organized a system in which government workers were appointed to specific jobs that they were especially trained to perform. Each worker received a salary. Each worker had to follow strict rules and report to a supervisor. People at each level supervised those below them. Tens of thousands died while building the Great Wall, giving the wall it's nickname of the "longest graveyard." Why did Qin build the Great Wall? Protection: As a Legalist, Qin set up a spy system and rewarded people for telling on others. He urged people to spy on each other at work, at home, and in their village or neighborhood. If people turned in lawbreakers, they were rewarded. If they did not, they were executed. It was a simple system, and it worked well. The organizational system he put in place gave Qin great power. That power allowed him to make huge changes. Qin knew that to unify China there had to be big changes. Most of his laws had something to do with protection. The Great Wall: Qin made people labor on the wall without pay. During Zhou rule, feudal lords had built walls to protect their properties from northern invaders and from their Chinese rivals. Using these older walls as its foundation, Qin began a huge project to connect the various pieces into one huge wall. By building a "great wall" Qin hoped to protect China from the Xiongnu nomads in the north. People who worked building the wall were not paid for their labor. They did not have a choice. This project continued for many hundreds of years after Qin's death until the wall was over 3700 miles long. What are three things Qin did to unify and control his empire? 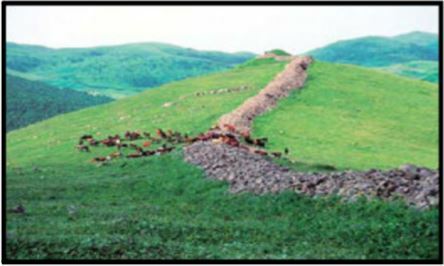 Remains of a wall that once protected feudal properties during Zhou times. Land Ownership: When Qin came to power, he took land away from thousands of nobles. He did not want noble families, those same families who had been feuding throughout the Warring States Period, to rise up against him. Anyone, including peasant farmers, could own land, as long as he paid the land tax. Anyone who argued against the tax was either buried alive or put to work building the Great Wall. Standardization: Qin introduced one system of weights, measures, money, written language, and laws. To unify China, Qin knew it was essential to have just one system of weights and measures and of money, and to have a standard written language. He minted coins. Pictured below is a Qin Ban Liang (half teal) coin. It became the national currency when Qin united China in 221 BCE. Qin also announced the weights and measures system that would be used throughout his empire, along with the written language that was acceptable. Nobody argued with him. If they did, they would be buried alive or sent to the Wall to labor. Qin also announced a new unified code of law that applied to everybody, and he introduced law enforcement to make sure these laws were obeyed. The Peasants: During Qin's time, people had two jobs - you were either a farmer or a weaver of silk. Those who sought to make money from crafts and trade would be seized and made into slaves and sent to work on the wall. If they were lazy, they would be made into slaves or sent to work on the wall. In Qin’s dynasty, you had to do your job, and do it well, or you would be put to work doing something you could do, like be a slave or work on the wall. This 18th century print, "Killing the Scholars & Burning the Books," depicts Qin's persecution of Confucian scholars. Education/ Book Burning: Qin persecuted scholars and destroyed books. He did not believe in any education for the common man. The more people studied, he believed, the less time they would have to grow food. Education was time away from growing food. Thus, education and the teachings of Confucius were bad. Useless books were burned. Useless books were defined as any books except those about medicine, agriculture, or prophecy. Over 400 scholars who refused to turn in their books were buried alive or sent to the wall to work. Censorship is the control of what people read, write, hear, and see. Qin practiced total censorship. Qin’s Tomb: Can you imagine digging in your yard one day, and discovering a life-sized terracotta soldier, made 2000 years ago completely out of clay? That’s what happened in China in 1974! 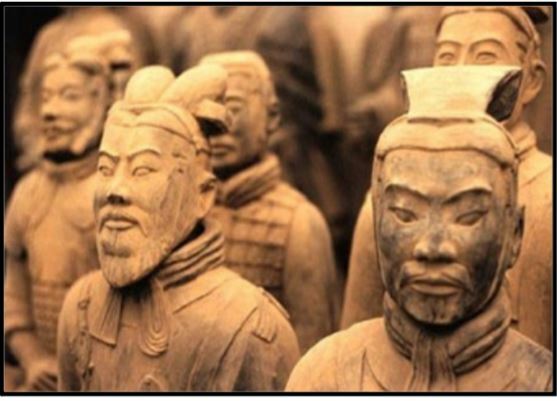 By the time archaeologists had finished digging, they had uncovered over 6000 life-size terracotta soldiers! Some are kneeling with terracotta bows, ready to shoot. Some are standing. Some have moustaches. Some have armor. They also found terracotta horses, spears, and chariots—all life-sized, all made out of clay. It took 720,000 laborers about 34 years to create this incredible grouping. They finished just in time, right around 210 BCE, when First Emperor Qin died and his son, the second Qin emperor, took over. What did Qin think of his method of fixing China’s problems? Qin did not think that his rule was cruel. “A thousand may die so that a million may live,” he said. Qin built roads, canals, and bridges. His public works projects probably saved millions of lives that would have been lost to floods and famine. Although many people died building the great wall, the wall did provide an advantage in war and offered some protection of trade routes. As for his goal of creating a stable China? No rebellion occurred during the emperor’s rule. Emperor Qin Shi Huand di died in 210 BCE. Once he was dead, his son took over. But he did not rule for long. People revolted against the Qin government all over the countryside. Liu Bang, the peasant who led that revolt, became the first emperor of the Han Dynasty. Brain Box: Do you think Qin's sometimes harsh methods were justified? Why or why not?